Sean Murray seems to blame LinkedIn. 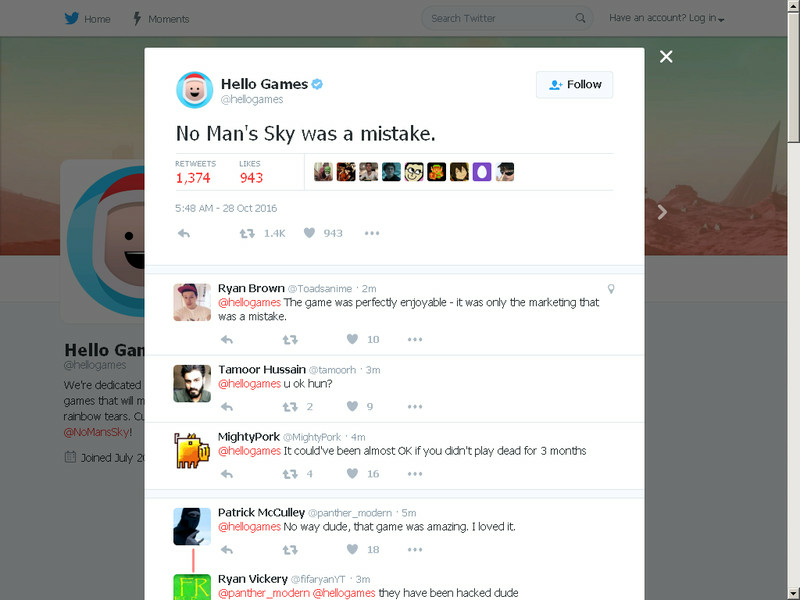 On Friday, Hello Games, the studio behind what was supposed to be one of the most popular video games of 2016, No Man’s Sky, tweeted out that “No Man’s Sky was a mistake.” The tweet was later deleted and the account made private. There’s since been a lot of back and forth as to who is responsible for the message. Hours after the initial tweet, Sean Murray posted on his Twitter account that the original Hello Games message was the work of hackers. This is very likely the actual reality since the original Twitter account has not been in use August 18. The confusion does not stop there, though. Sean Murray reportedly told Mashable that the tweet came from a “disgruntled developer” and that Hello Games is dealing with the issue internally. Other outlets received emails pointing in other directions. At this point, it’s unclear what’s real and what’s not, but the best course of action would probably be to ignore those emails and the Hello Games Twitter account in favor of Sean Murray himself over at @NoMansSky.
.@hellogames are you still hacked and stuff? Murray apparently believes, at least jokingly so, that not having two-factor authentication at LinkedIn somehow led to accessing the Hello Games Twitter. This kind of social engineering isn’t uncommon; breaking into one site that’s connected to social media accounts is an easy way of accessing them that only requires one weak link in the chain. The recent event is almost as confusing as the actual No Man’s Sky game, which, since its release, has received several negative reviews from fans who feel the developer never delivered on its promises. Even now, it remains to be seen if the game will improve in the future, but one thing’s for certain: More than one person believes it was a mistake.